IMCA® and CFP Board® CE credit eligible. Everyone makes active bets on asset allocation. But few do it thoughtfully. Thousands of asset allocation methodologies are compatible with efficient markets. That’s why advisors need to understand the implicit “bets” they place when constructing portfolios. The first webinar in our four-part series covered the role of asset allocation versus security selection in achieving clients’ long-term objectives and introduced the only portfolio that makes no active bets — the Global Market Portfolio (GMP). •How the markets have historically priced different measures of risk and dynamic versus static portfolio assumptions. 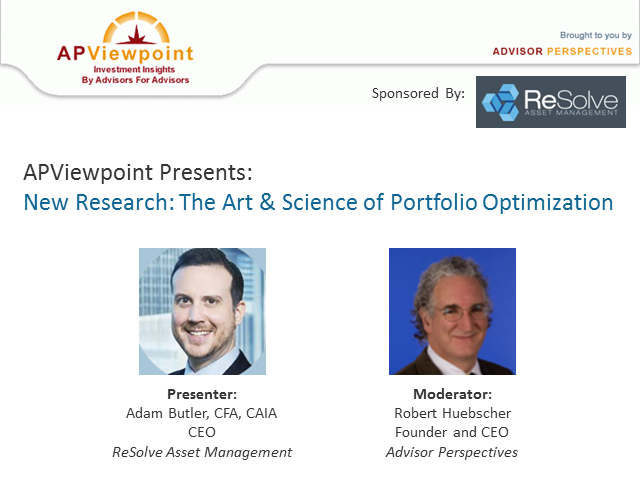 Adam will answer attendees’ questions during the webinar and will be available to continue the discussion on APViewpoint. Future webinars will explore the advantages of risk parity and introduce more active multi-asset "factor" strategies like Adaptive Asset Allocation. The CFP Board has accepted this program for 1 hour of CE credit towards the CFP® certification. In addition, IMCA has accepted this program for 1 hour of CE credit towards the CIMA®, CIMC® and CPWA® certifications. If you provide the required information during the webinar registration process and stay for the entire session we can report your attendance to these organizations.